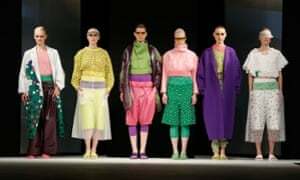 Graduate fashion week (GFW) finished on Tuesday evening with a gala catwalk show crowning the recipient of this year’s gold award. Hannah Wallace, from Manchester School of Art, was named the winner for her edgy but wearable ski-influenced collection featuring oversized padded jackets and logoed sportswear. Her prize is £10,000. Previous winners of the GFW gold award include revered designers Matthew Williamson, CEO and creative director of Burberry Christopher Bailey, Stella McCartney and Giles Deacon. The front row at east London’s Old Truman Brewery, where the event took place, included style blogger Bip Ling, and Suzy Menkes, international editor of Vogue. They watched as florals and boxy sportswear emerged as trends, with an influence from music culture ranging from reggae to hip-hop. Students from the University of Brighton to the University of Salford also showcased their collections. Other award-winners included Melissa Villevieille from Edinburgh College of Art, who won the catwalk textile award and the womenswear award, and Ella Nisbett from Nottingham Trent, who won the Stuart Peters visionary knitwear award and the menswear award. The hugely respected MA courses at Central Saint Martins and the Royal College of Art are likely to be the source the next intake of own-label designers on the London fashion week (LFW) catwalk. But events such as GFW allow the spotlight to fall on universities outside London, and move the focus away from the world of high fashion to the rest of the industry – where the majority of fashion graduates work. Winner Wallace’s work has a notable edge, and other eccentric elements included animal heads from Maria Philippou, and Poppy Russell’s ode to northern soul, which came complete with dancers. More commercial collections came in the form of Nisbett’s and pretty vine prints from Georgie Wood, of the University of Salford. This reflects the fact that many of the 1,000 graduates involved will be recruited to the design teams of high-street brands rather than setting up their own labels. Boohoo.com and River Island were both recruiting at the event. Running across a long weekend, the 24th edition of GFW included 23 BA shows and had contributions from 40 UK universities. Unlike LFW, the event is open to the public, with show tickets available for between £11 and £35. The multi-focused event combined vocational advice with fashion entertainment, plus talks between industry figures such as V&A curator Claire Wilcox and model Erin O’Connor, live photoshoots, and the chance to see a 3D printer in action. Nearly 30,000 visitors came through the doors.